AVELife TestGold Studio is the powerful assessment tool for training, pre-employment screening and periodical certification of your staff and students. The software lets you create professional tests, run and deliver them, secure store and comprehensively analyse testing results. Test participants locally, in company network and distantly. Collect and analyse testing results. 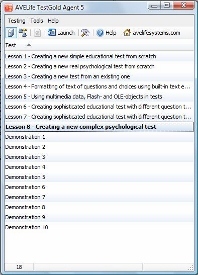 TestGold has powerfult test format: 12 question types, scales, complex scoring, built-in text editor for rich formatting of and advanced multimedia support for questions, answers, hints, feedback, test and question introduction. Simple, but nice user interface, separate distributive and minimum of required local settings will help you dramatically reduce its start-up stage.